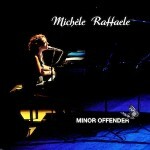 A refined and elegant sound is what stands out while listening to Michèle Raffaele’s first EP “Minor Offender”. Timeless songs, designed to live off their own intense light. “Lady Maybe” is a soft piece, which oozes jazz. Michèle’s voice is fascinating and the piano music hypnotic. “Remember Me Next Sunday” seems to tell about a lost gaze, a deserted street, where other people’s eyes get lost. It’s dust, and paradise. Like notes delivered on cobbles, like still dreams in an abandoned station.